I'm slowly ploughing my way through the 1903 edition of "Chemie der menschlichen Nahrungs- und Genussmittel". It has over 1,000 analyses of beers, mostly German but with examples from most major brewing countries. I've already harvested the analyses from a couple of earlier editions, which means there are only 100 or so I need to collect. To add to the 20-odd thousand in my main gravity spreadsheet. It's getting to be quite a collection. Which is sort of the idea. 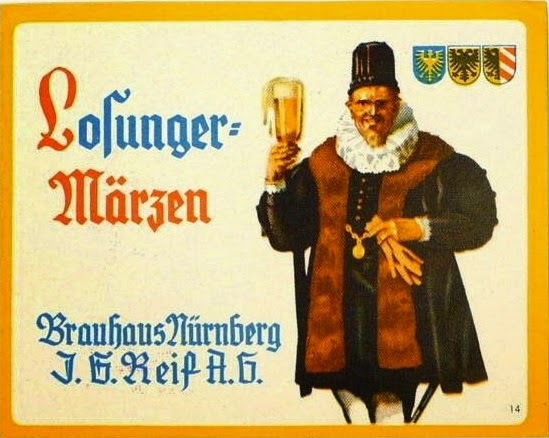 To quickly recap, in the 19th century Lager was split into two main types, Winterbier and Sommerbier. Before refrigeration, both were brewed in the winter, but the Sommerbier was stronger and lagered for longer because it needed to last through the summer. Sommerbier was also called Lagerbier and Winterbier called Schenkbier. This is a particularly useful set of analyses because it has the Winterbier and Sommerbier from the same brewery for the same brewing season. Which means we can make meaningful comparisons between Winterber and Sommerbier. There are a couple of examples where clearly the same beer has been analysed as both a Sommerbier and a Winterbier: Tucher, Lederer and Lechner. Chemie der menschlichen Nahrungs- und Genussmittel by Joseph König, 1903, pages 1102 - 1156. As you'd expect, the Sommerbiers have a higher average gravity: 1058 compared to 1053.6. So a difference of 4.4 points. But there was considerable variation across different breweries. Ranging from a negative 0.3 points at Mailänder to a massive 11.7 points at Dürst junior. Interestingly the average FGs are almost identical at 1016-ish. The inevitable consequence of which is that the degree of attenuation of Winterbiers is lower. Modern Lagerbiers are very different, averaging well over 80% apparent attenuation. The Sommerbiers range from 1048.8 to 1064.7 and the Winterbiers from 1047.6 to 1059.6. Which means that the weaker Sommerbiers have a lower OG than many Winterbiers. It's a lot more variation than you would see in British beers of the same type from the same region. Though 14 of the 28 samples of Sommerbier had a gravity within two points of the average. For Winterbier, that was 13 of 23. Unfortunately there's nothing about hopping rates. So I can't confirm that Sommerbier was more heavily hopped than Winterbier. I'm sure I'll be worrying you with plenty more from "Chemie der menschlichen Nahrungs- und Genussmittel". It's so full of information. Presumably Schenkbier and Schankbier (a term you'll still see sometimes) are spelling variations of the same thing? With Sommerbier coming back into fashion, it would be fascinating to compare today's versions with the 19th century ones. How about historical recipes for Sommerbier - or would the lack of hopping data kybosh that? And where do the many German ice-houses fit into this? I was under the impression they were to allow summer brewing in the pre-refrigeration days, but I guess I was wrong. Would you suggest lager in this sense has a coo notation analogous to " stock"? Interesting Ron. I'd hazard that higher lactic acid and lower attenuations went together like love and marriage used to. A richer malty taste probably had evolved imperceptibly over time to make the unavoidable lactic edge of the drink more palatable. Later, when better QC eliminated the acid quotient, you could raise the attenuation to make a drier, more "elegant" drink (also one presumably that could be drunk in greater unit numbers, a stat beloved of brewers anywhere at all times). I am surprised the lactic average of the schenk and lager was virtually the same. One would think long storage even at cold temperatures would raise the lactic acid. In this one sense, the beers were very stable. But it does suggest that they could not avoid such a high lactic content to begin with - unless they wanted the taste that is. perhaps at those attenuations, the slight acid tang was felt to complement the palate. The love and marriage thing again. Could Kirsten create a beer like these toady with these averages and using hop spec taken from other analyses? I wonder how the taste notes would read. Not seen any recipes, just hopping rates. The ice was used to keep winter-brewed beer cool in the summer. They only started year-round brewing after the introduction of artificial refrigeration. yea. Exactly the same. You could say Winterbier and Sommerbier were the equivalents of Mild Ale and Stock Ale. my guess is that the poor attenuation was due to low-quality malt or brewing techniques rather than by design. Though you should see the neext set, Lagerbiers from Nürnberg. Did Guinness dominate Britain after WW I?